Desk Report: Prime Minister Sheikh Hasina is set to join today (Monday) the concluding ceremony of a Saudi-led joint grand military exercise named "Gulf Shield-1" in the kingdom's eastern province of Al-Jubail. She will attend the function at the invitation of Saudi King and the custodian of the two holy mosques Salman bin Abdulaziz Al-Saud as the parades of armed forces of 24 participating countries including Bangladesh will feature the ceremony. 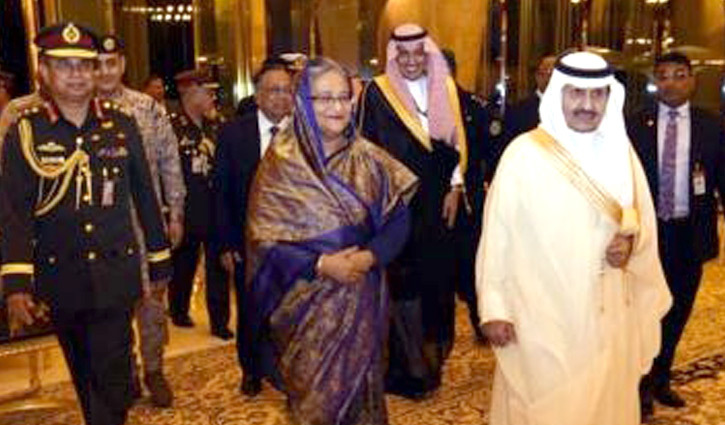 The Bangladesh prime minister arrived here Sunday evening on a two-day official visit to witness the military exercise while a VVIP flight of Biman Bangladesh Airlines carrying her along with her entourage members landed at Dammam King Fahd International Airport at 7:35 pm local time. Saudi Minister of State and Member of the Cabinet for Majlis Al-Shura Affairs Mohammed bin Faisal Abu Saq and Bangladesh Ambassador to Saudi Arabia Golam Mosih received the premier at the airport. Saudi Arabia organised the month-long military exercise for boosting defence cooperation and coordination with friendly countries to protect the Gulf regional security and peace through enhanced military readiness, also to ensure global peace. The Arab News, Saudi Arabia's biggest English language daily, said King Salman would oversee the conclusion of the Joint Gulf Shield-1 military drill in the presence of a number of leaders of friendly countries participating in the exercise, which lasted for a month. Spokesman for the military exercise Brigadier General Abdullah Al-Subaie on Saturday said the Saudi defence ministry organised the drill with participants of land, air and naval forces from 24 countries. The countries are the USA, the UK, the UAE, Saudi Arabia, Bangladesh, Bahrain, Qatar, Kuwait, Egypt, Jordan, Sudan, Mauritania, Malaysia, Pakistan, Chad, Djibouti, Niger, Comoros, Afghanistan, Oman, Guyana, Turkey, and Burkina Faso. An 18-member delegation of Bangladesh Armed Forces is participating in the exercise that began on March 18. Abdullah said the drills featured two types of military operations with one being conventional military operations represented by coastal defense attacks against the enemy. The other one, he said, was the irregular war operations carried out by besieging and penetrating villages and industrial installations so as to cleanse them of hostile elements. The spokesman noted that one of the most important aims of the exercise was to activate the concept of joint military combat operations plans to counter hostile acts that could threaten the security and stability of the region. "The exercise displays the military uniformity between the participating countries, in addition to the development of a sense of collective security, unity and common destiny," he said. The Saudi spokesman said the drill was also expected to strengthen the relationship between brothers and friends participating in the exercise, standardize and activate the systems and procedures of command, control, and communication of the participating forces and finally give training on logistics operations in military operations. Analysts said the military exercise is considered one of the largest in the region, both in terms of the number of participating countries and the quality of its weapons. Some of them called the Gulf Shield-1 drill a turning point in terms of the techniques used in accordance with the most modern military systems in the world. Sheikh Hasina will leave Dammam for London this afternoon to attend the Commonwealth Heads of Government Meeting (CHOGM) Summit.